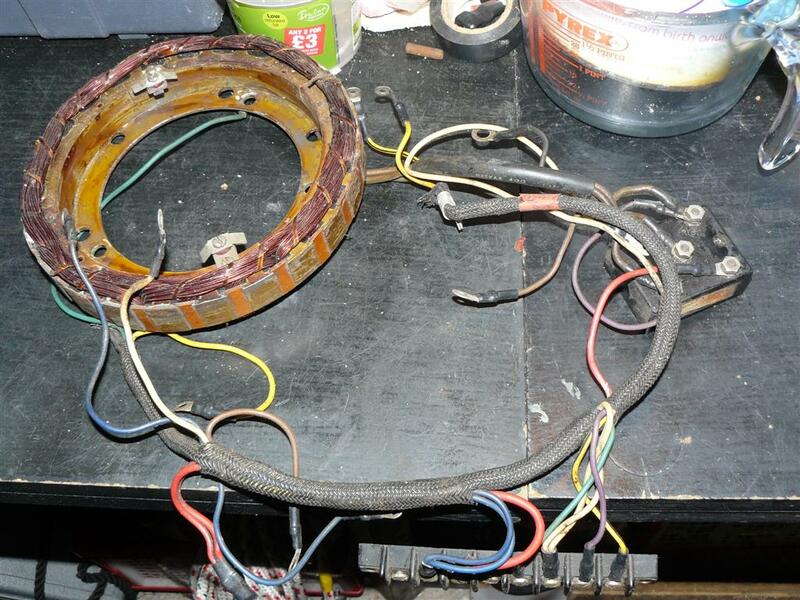 This stator and rectifier was saved from the trash a few months back, in the hope that it may fit my '68 Chrysler 55hp motor. Is it suitable for the Electric Alternator 55hp model, or is it a C-D Alternator version (TypeA)? My factory service manual seems to indicate a different shaped version for the battery ignition system and another C-D Alternator type, but I wondered whether they're interchangeable? 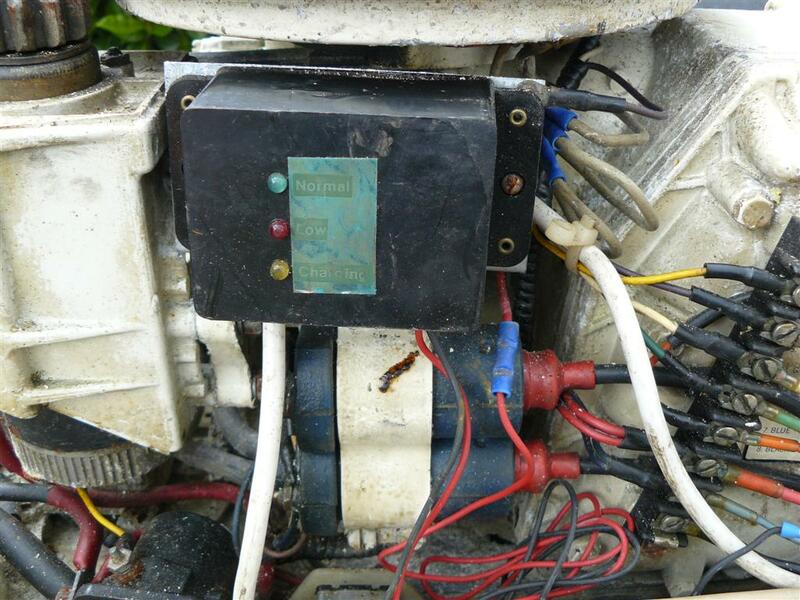 As you can see there appears to be a home-made kit on the motor (which looks as if it's overheated). My 45HP with points-CD has a single phase alternator. See the posts where we found your cam was upside down. I think the high output 3 phase alternator, like you have there, was an option. I suspect the battery-coil and CD used both in different models. But the info I have is sketchy. I would assume both used the same flywheel, but I don't have a parts list for the 3 phase version to tell for sure. The number of magnets has to be correct, but they could have worked it out where the same flywheel worked for both. 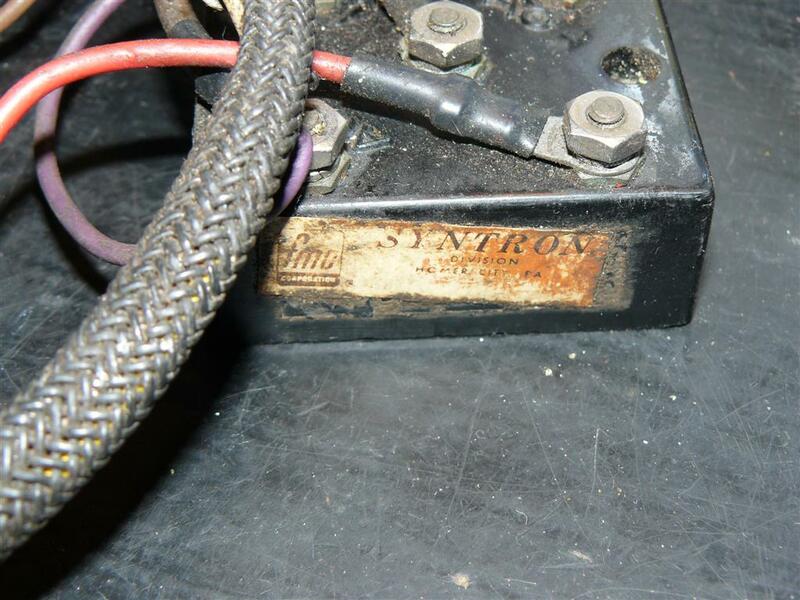 That rectifier does looked cooked. The five screw is for the 3 phase and the 4 for the single. I see those on eBay all the time. They do come in a couple of different shapes. Look for mounting holes like yours. I thought at first my rectifier was toast, one terminal was broken off. But with a little JB weld and solder I spliced the terminal back in and saved 40$. If I could not have saved it I would likely have used a standard square 4 terminal bridge to replace it, for 5$. With the 3 phase you need a handful of 10 amp diodes but its still doable. The box with the 3 leds on it I have never seen before, some aftermarket thing? The box with the 3 leads appears to be an aftermarket thing. I opened it up to see how it was made but there's some brown set sealant that fills the inside...so we'll never know. I am still a bit stumped & the jury is out, but am inclined to your theory; that both battery-coil and CD used them - am told p/n 369450 is correct for my '67 model 5561, and it's interesting to see that both 4 and 5 terminal versions are now replaced by p/n 155-1450 - at least that's how it looks to me. The Force versions were prefixed with the F and same part number & continued through the 1990s. And the windings on the spare stator look the same as that on my 3 lead version too. I may find out more next week - a kind dealer has offered to hunt through his parts motors for me. I can see where the single phase and three phase rectifiers could be replaced my the 3 phase version. You just dont use the 3rd ac input on the single phase version. Neither of them are real special. A 10$ square common spade terminal 10 amp rectifier will replace one. Not factory looking but will work fine. Finally managed to fit the spare 5 terminal rectifier onto the 55hp. I need to make sure is charging the battery now. Interesting that when I run the motor, it doesn't pump all that well. I am running it in a static drum, with water level above the pump housing and without the thermostat in, but the spray from the exhaust snout is nowhere near as impressive as the '74 45hp, which really gushes. The impeller is a new 10 blade version and the pump housing is sound. I read that the 6 vane version is more effective, but know of no one who can yay or nay this..I dropped the box and rechecked my work, all seemed fine. It seems on this motor, a '67, that the only way the pump primes is through the intake below the anti-cav plate and up the small diameter pipe to the pump. Should I be worried? My assumption is the flow of water above idle generated by the force of the propeller is enough to take care of the real cooling? It does make setting it up in the tank a bit hit and miss though. Did chrysler make a flushette like the omc versions that perko used to make? The hosepipe pressure might make it easier to setup in the tank, prior to a water test. I use a generic ear muff type on mine. But I test cooling in a tank (trash can ) to make sure it really works without the pressure of the hose helping. Do not run these guys without a thermostat. (Yes I know early Mercs did not have stats I have one) You can over cool a engine and in the case of outboards it can cause scuffing damage. When the stat is closed the pressure from the blockage opens the bypass valve and the excess water is dumped into the exhaust. Put the stat back in and try again. I have never run one of these with out the stat so I cant say for sure if that is the difference in the flow out of the nose hole. A infrared temp gauge from harbor freight is real handy to see if the thermostat is working and the water flow is good. A good sign is the exhaust cover is cool. Considering the stat opens on these at 140-160 (depends on model and year)The head should never get over the stat opening point just idling in a bucket. The exhaust cover would not get over say 180-200 Never should the paint get soft or change color. Generic advise I know but its hard to be specific on this. Check that the pump housing flange is flat. I sometimes sand them flat by taping a sheet of emery cloth to a flat surface (saw table?) and sand in figure 8s, turning it in my hand every few strokes, till its evenly shiny all the way around. Get a manual and make sure the pump is assembled right, all parts, present and accounted for.